Even though this article is geared towards a more technically versed audience, there’s still plenty to learn for any business when it comes to WordPress SEO. These little tidbits come from years of study, trial and error. Here’s what we find works best for our clients. Don’t tell anyone though, OK? The WordPress CMS is one of the most commonly used website platforms, but not all are the same. We won’t dive too deep into each plugin setup since each one depends on your needs. But we will discuss how each plugin can help you. All of the plugins are free, but some may have upgrades available for more options. Supercharged SEO and Google Analytics services for your brand. Call (443) 475-0787 or Contact Us today. Most people don’t think about security when discussing SEO, but Google is very strict about malware and spam on websites. This means security should be the very first plugin to install and setup. Before installing any plugins, be sure you’re not using “admin” or something similar as your Administrator account, as this will make it more difficult for hackers to determine your main username. We recommend iTheme Security plugin, it is by far one of the most robust and comprehensive security plugins out there. We’ve found this plugin to be so solid that if not configured correctly, you can accidentally block yourself. To prevent that from happening make sure you whitelist your IP address. For a full list of security recommendations from iThemes follow this link where you’ll find advice on how to configure each section of the plugin. Once your Website is secure, get your tracking set up next. Every website needs some form of tracking. We recommend the free version from Google Analytics. This can be placed in the header of your theme settings, however, consider using a plugin for this to give your website some extra options if needed. We use Google Analytics by MonsterInsights, and there’s a free version that provides everything most users need. You can connect it to your Google Analytics account or manually enter the UA number from your Google Analytics account. If this plugin doesn’t provide enough robust Analytics settings, we recommend looking into Google Tag Manager. Try DuracellTomi’s Google Tag Manager for WordPress plugin. This plugin was one of the first ever Google Tag Manager plugins for WordPress and continues to provide very customizable settings. 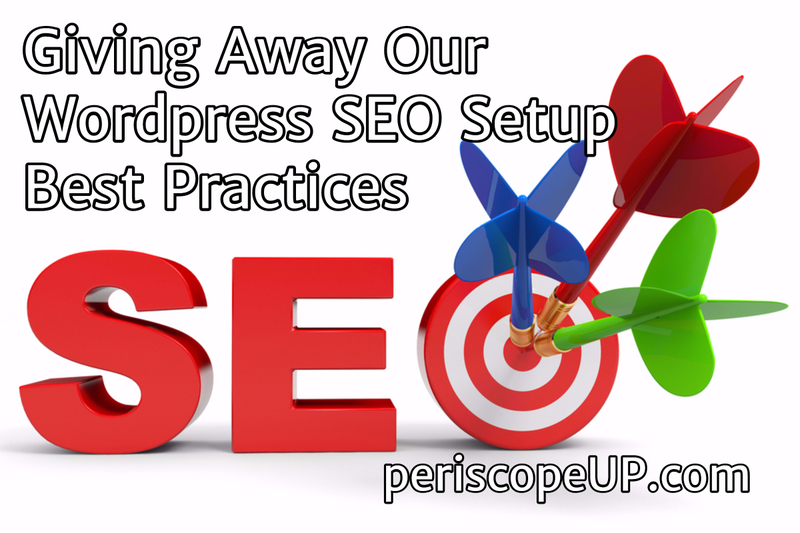 Now that security and tracking are configured, you need to have a WordPress SEO plugin installed. By default WordPress does not have metadata fields to optimize/adjust, and WordPress generates junk pages over time as your site grows. These can be duplicate category, paginated, author and tags pages. These cause problems when you try to optimize pages or posts for specific keywords or try to prevent other SEO glitches. There’s a way to manually add meta tags into your theme, and some themes even have their own SEO settings. However, it’s rare to get everything you need to have a technically SEO sound website. The Yoast SEO plugin is considered to be the number one WordPress SEO plugin. We’ve implemented this plugin on every site we work on and have even replaced other SEO plugins with this one. Yoast has a great configuration guide that will cover all the basics along with a large number of links to more specific settings and guides. Now let’s take a look some one-off plugins that may or may not be needed for your specific installation. If you change URLs or migrate/move websites than you will need a 301 redirect plugin, we recommend the Eggplant 301 Redirects plugin. Rich snippet schema markup can be used for recipes, events, articles, or other types of content. The All In One Schema.org Rich Snippets plugin allows you to manually set each post/page to the exact markup you need. Pagespeed is another important SEO factor. We recommend W3 Total Cache, one of the most commonly used caching and minify plugin. This plugin can be very dangerous and even break websites, so use a guide. WPMU Dev has a great guide for W3. We use a number of plugins from WPMU Dev and have been doing so for years. Their support and plugins are amazing. One plugins to go along with caching is WP Smush. It helps compress/smush your images on your website to help them load faster for users and search engines. A more recent update to SEO is the new AMP markup for Mobile websites. WordPress and AMP don’t go hand in hand without serious coding, but the people at Google have given us an AMP plugin that gives you a good bit of customization for theme. There are some missing parts that you may still like to adjust which you can do using Glue for Yoast SEO & AMP add-on plugin. There are a number of alternative plugins to the ones listed above. However we’ve tested alternatives over the years and have found that our recommended plugins are stable and have great developer support and documentation. We highly recommend you establish backups before making any changes or moving to new plugins. If you would like assistance with plugins, we offer support and maintenance plans for WordPress websites. Or feel free to leave a comment below and our experts will be happy to offer some advice and recommendations. Improve your SEO results dramatically. Call (443) 475-0787 or Contact Us today.